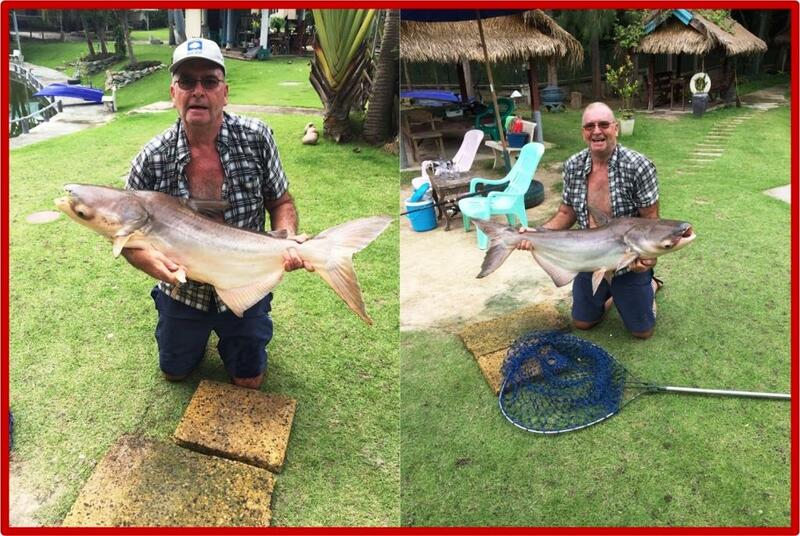 The following images are just SOME of those taken by us or our happy customers and demonstrate that, you do not have to pay a fortune for a days fishing, with plenty of variety in the catch, at Hua Hin Fishing Lodge – join us for a great day out. We appreciate customer feedback, both good and the very occasional not so good, so that we can improve our services to ALL of our customers. 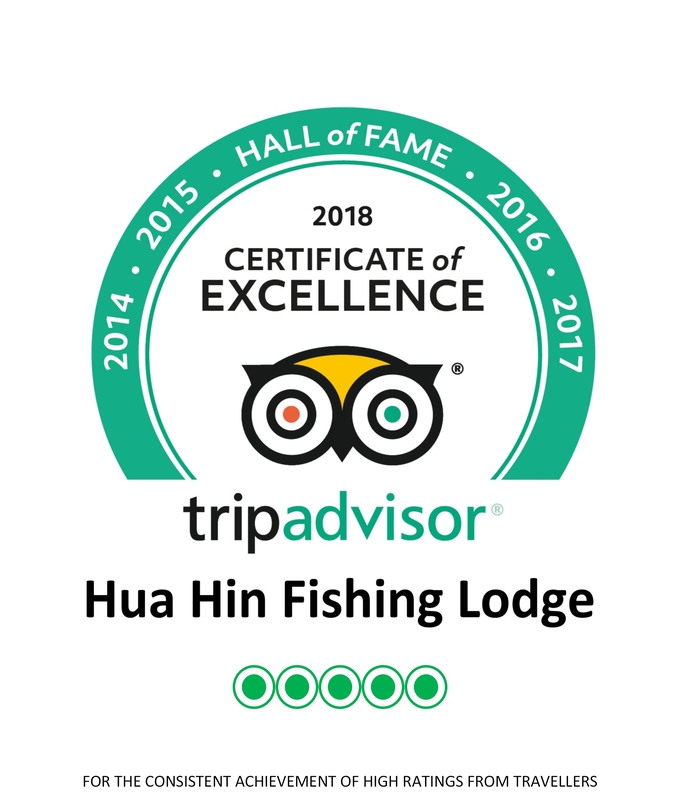 At Hua Hin Fishing Lodge, we aim to provide simply a great fishing experience, coupled with good service and honest value for money, for all of our guests, their families and friends. 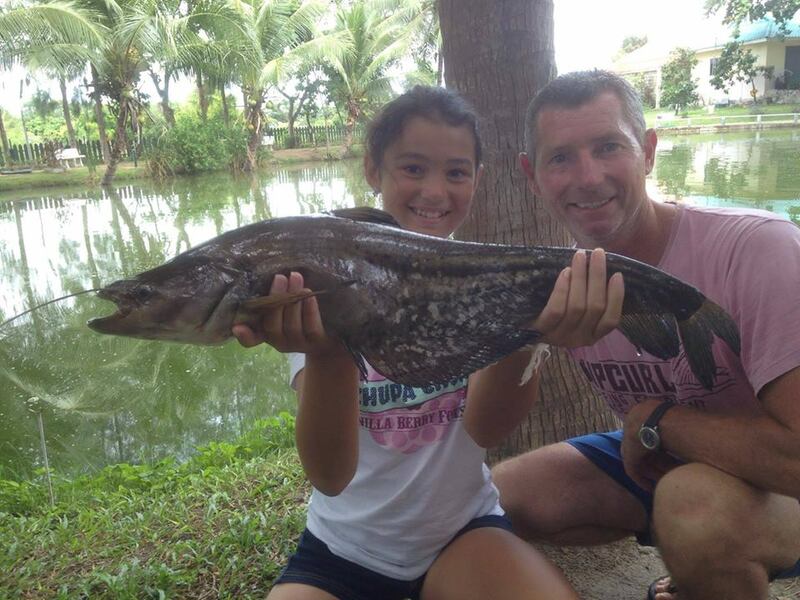 ESTABLISHED IN 2003, WE STILL HAVE AND WILL ALWAYS HAVE, SIMPLY THE BEST VALUE, FAMILY FRIENDLY, QUALITY, FRESHWATER, CATCH & RELEASE**, LAKE FISHING IN HUA HIN. 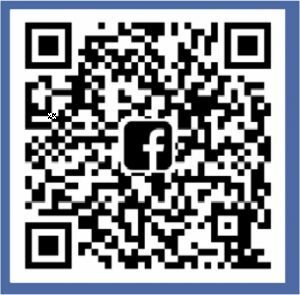 You can also find us on ‘Facebook’, where we currently have 1,425 genuine, organic (i.e. we didn’t pay for them !!!!) ‘likes’, together with a 4.8* of a 5.0* review rating. Don’t just take our word for it – come on over and check us out! For full details – check out our RESTAURANT MENU page. Some of the recent activity at the Lodge. Plenty of good catches despite the hot weather. 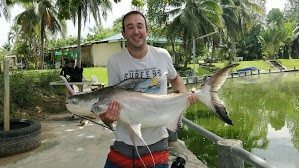 Amongst them were, Alligator Gar, Giant Mekong Catfish, Chao Phrya Catfish, Amazon Redtail catfish and plenty of Giant Siamese Carp. We’ve also welcomed some nice new Shovel Nose Tiger Catfish to both ponds. 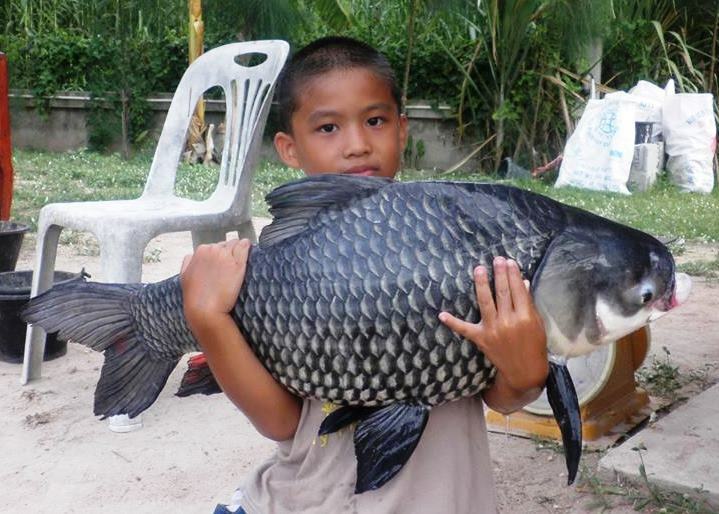 Species caught included Arapaima, Alligator Gar, Giant Mekong Catfish, Giant Siamese Carp, Suwai Catfish, Amazon Redtail Catfish, Pacu, and Rohu. Well done folks – bucket list well ticked. 20/07/18 Dirk Köhler and his family departed the Lodge having spent 9 nights with us. 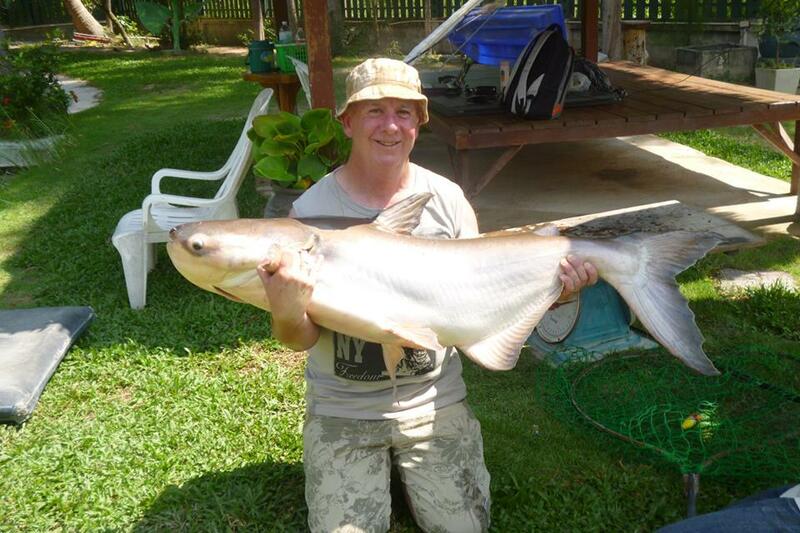 They have stayed with us for similar periods over the last few years, using the Lodge as a base to tour Hua Hin and also of course to fish our two ponds. The weather this time around was mostly overcast and rainy – but that never dampened the enthusiasm of Dirk and his son to catch a few fish. Over six sessions there were many fish landed – we lost count. However, as usual our friends managed to get some of our better specimens. 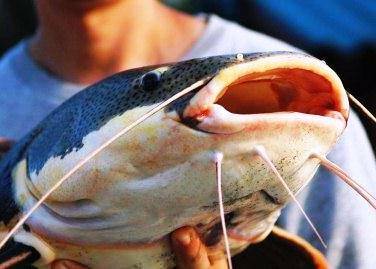 Amongst these were Arapaima, Alligator Gar, Giant Mekong Catfish, Chao Phraya Catfish, Amazon Redtail Catfish, Suwai Catfish, Pacu, Giant Siamese Carp, Black Minnow Shark Carp, Rohu, Clown Knifefish, and Mad Barb. Above are just SOME of the many photos that Dirk has shared with us. Thanks again for your continued patronage Dirk, and we look forward to seeing you again next year. Everything comes to he who waits. 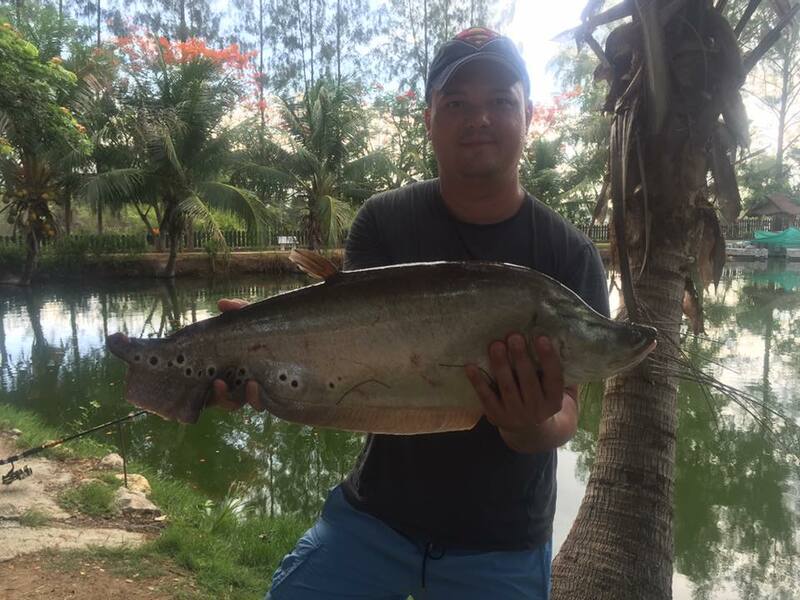 Martin Boman had been successfully fishing Chalong Fishing Park in Phuket. 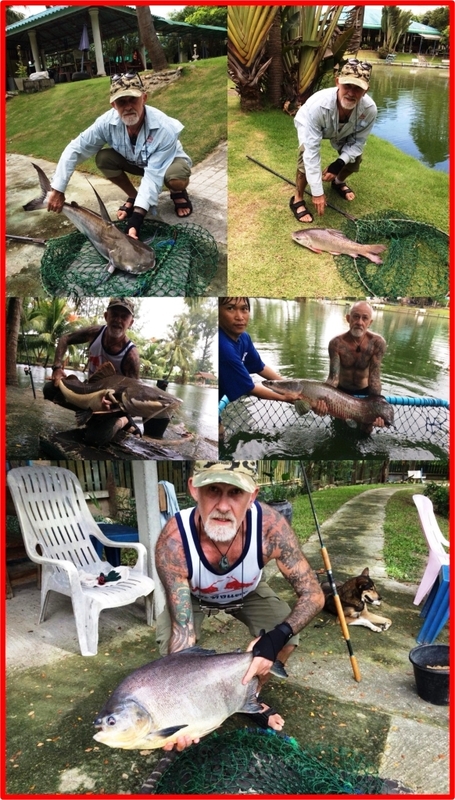 Jez kindly referred him to Hua Hin Fishing Lodge to pursue his species hunt. 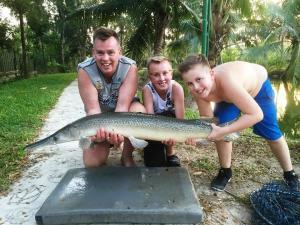 On 12/07/18, he completed 3 sessions with us and finally got his target fish – an Alligator Gar. 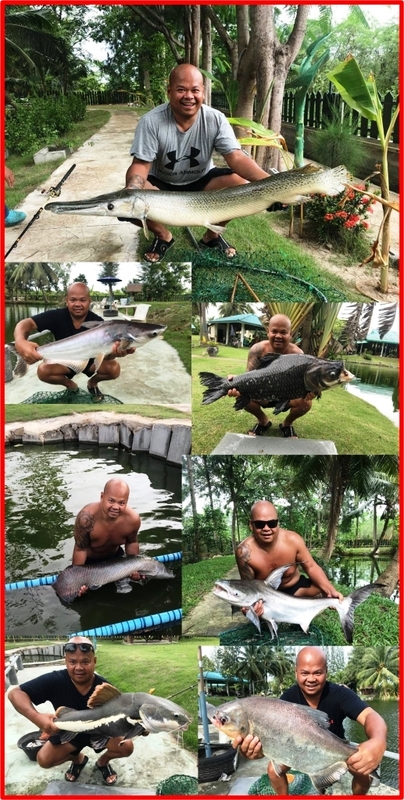 On the way he also bagged quit a few of our other species, including plenty of Giant Siamese Carp, Suwai (Striped) Catfish, Pacu, Amazon Redtail Catfish, Arapaima and Chao Phraya Catfish. SOME of his catch shown above. Well done Martin and good luck with your future fishing adventures. 10/07/18 Gog Unnim made a welcome return to our top pond, with his family. Fishing was not too easy, with mixed weather conditions – but above are a few pics of his catch. 9th July saw Blake & his Dad visiting us on our day PACKAGE. These guys were not used to still water lake fishing but soon mastered the methods and ended up with a good haul between them. Above are some of the photos of some of their catch. Well done guys. 5th July – Marion, Quentin & Nathan Thill joined us for the day and had a real blast. Karen & Gordon Thomas. These were just some of the fish caught when they visited us on our day PACKAGE three times at the end of June and had some good fishing. There were plenty of Giant Siamese Carp, Suwai, Pacu, Amazon Redtail Catfish, Alligator Gar, Arapaima and Chao Phraya Catfish. It was a pleasure having you guys here and good to know that you enjoyed your experience with us. Hope to see you again soon. Another returning customer, John Metcalfe, completed two visits with us (10/06/18 and 17/06/18). 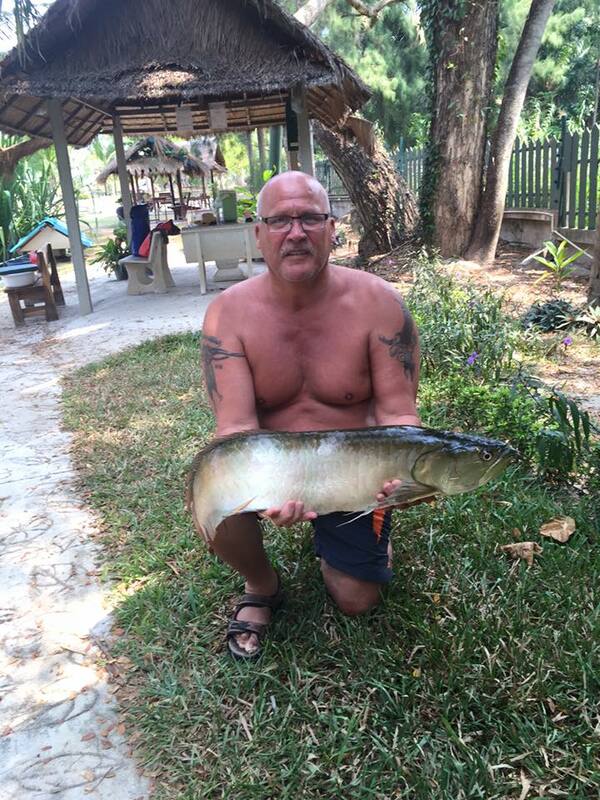 On the first visit, apart from some 7 – 8 Giant Siamese Carp, he managed a beautiful Julien’s Carp AND a Takok Tapien. These latter two species are some of the rarer varieties that we have. 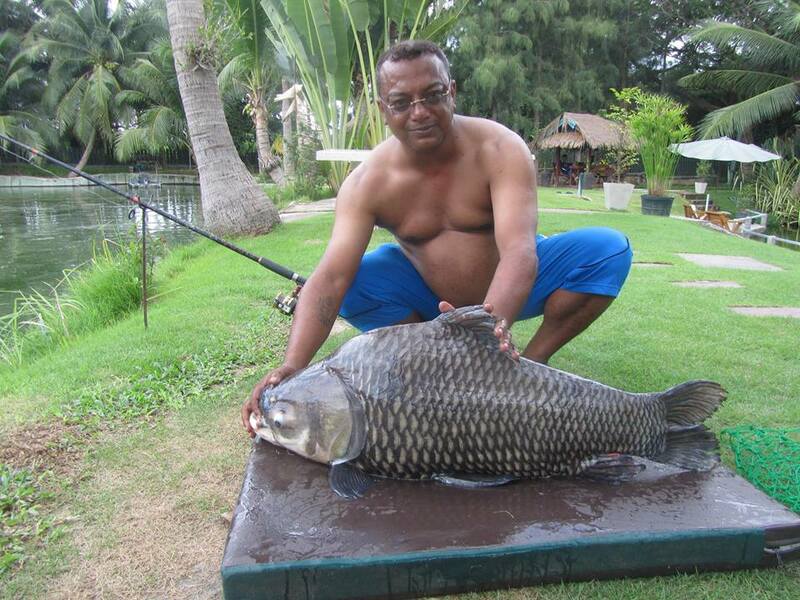 On his second visit he returned to target Arapaima. Assisted by our resident bait minder Sy, he managed to bag two in the bottom pond. Well done sir. Niall Forster made a welcome return visit on our all-inclusive day PACKAGE 04/06/18. He’s visited several times before, but on this visit he surpassed his previous records with 21 fish of 7 different species. A day of sunshine and heavy rain saw the sometimes-difficult conditions rewarded with a fine catch. Included were 4 Arapaima, some good Amazon Redtail Catfish, some chunky Giant Siamese Carp, Pacu, Suwai Catfish, a nice little Rohu and a splendid Chao Phrya Catfish. Above are just some of the photos that he has sent. Well done Niall and thanks for your continued support. Saturday 10th March – Was a very busy again at the Lodge. After Friday’s pouring rain, the fish were feeding again. Today, it was the Arapaima in the bottom pond that were active, with, amongst others, 3 of them, caught by Thomas Dovling and his party. Thomas has been fishing here many times and has never managed to catch an Arapaima before this visit. 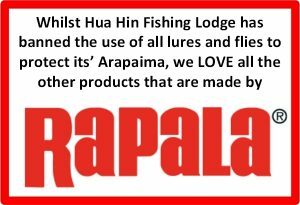 He has also donated a very fine RAPALA weighing net and scales (up to 25 Kg) to the Lodge. Thank you, Thomas – and of course RAPALA. 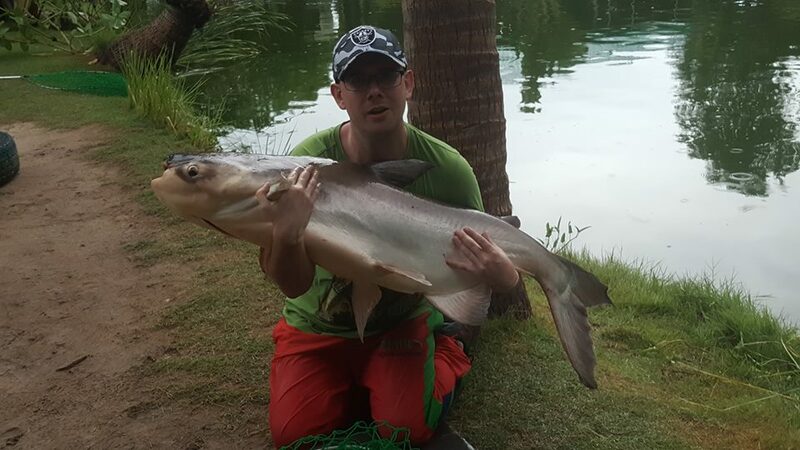 These scales were put to fine use, when returning ‘Day PACKAGE’ customer, Jesper Jakobsen pulled a nice 22.38 Kg Giant Mekong Catfish from our top pond. (Almost 50 lb in old money). 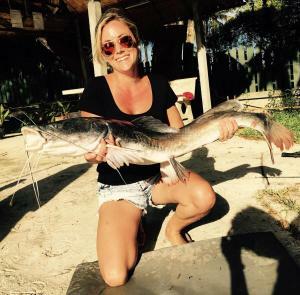 Christelle Bardez and her partner also joined us on the bottom pond and bagged a good Asian Redtail, an Alligator Gar, some Pacu and some Siamese Carp from the top pond. For our other visitors, some Siamese Carp (Some to around 19 Kg) and plenty of Suwai & Pacu to keep the kids amused, plus a late Amazon Redtail for Jesper – All in all a fairly good day. George Sidgwick joined us 5 times during his holiday in Hua Hin. 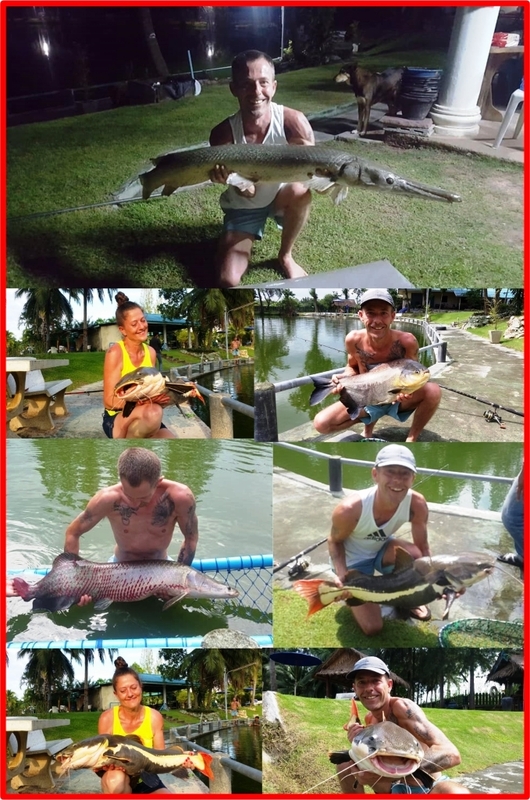 He has sent us these great pics of just SOME of his catch. 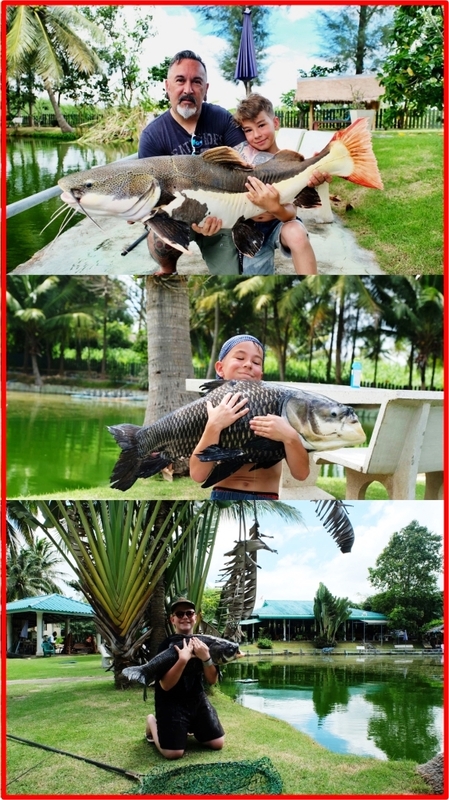 Pacu, Giant Siamese Carp, some really nice Amazon Redtail Catfish, some Alligator Gar and the Arapaima that he was after. But the two stars of his visit were a rare appearance of a delightful Rohu and a strikingly beautiful Chao Phraya Catfish – both from our bottom pond. Thanks and well done George. Daniel fished with us at the Lodge last year and managed to get an Alligator Gar. He returned yesterday 01/02/18 on our ‘day package’ to try for amongst other species, some Arapaima. I’ve been out and about today and Daniel’s camera has broken – but – we managed to get these few photos of today’s exploits. 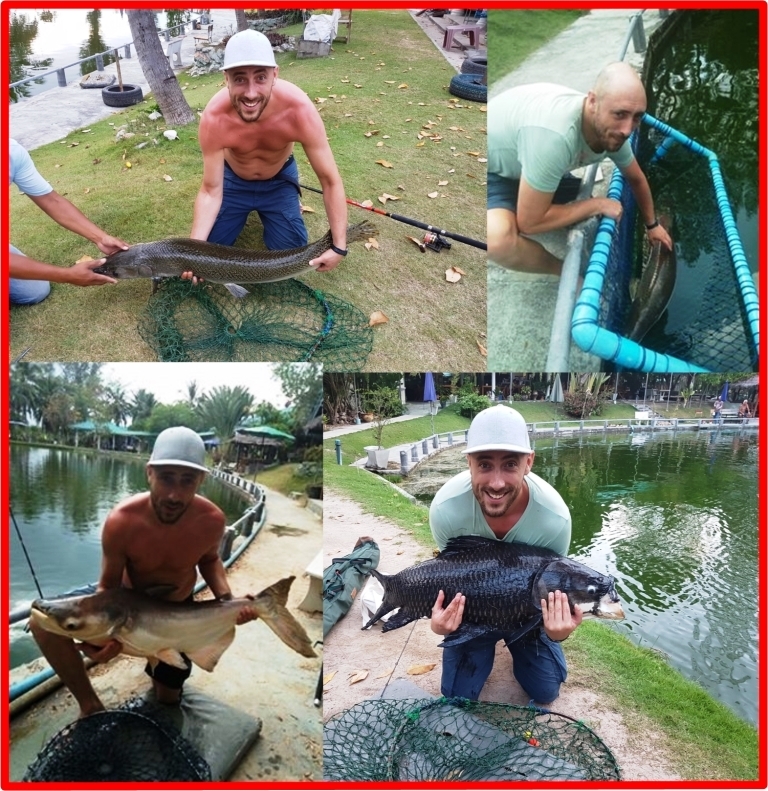 Apart from several Pacu, and copious amounts of Suwai Catfish, Daniel managed to get himself a couple of Giant Siamese Carp, another good Alligator Gar, a Giant Mekong Catfish and 3 Arapaima – the smallest of which is shown here. Great stuff Daniel – look forward to your next visit. Torsten Karden, partner Bianka, and son Andreas from Lübeck Germany, visited the Lodge several times over the New Year period. They caught loads of fish on every visit, on both of our ponds. They very kindly sent us the attached photos of just SOME of their catch. 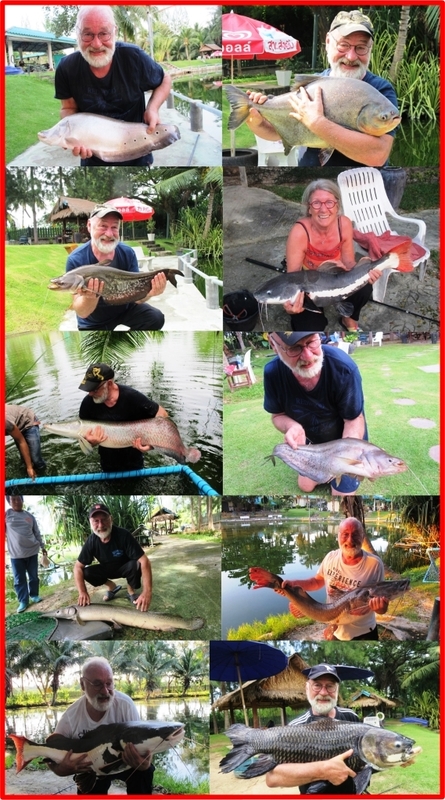 These included many Giant Siamese Carp from our top pond, plenty of Amazon Redtail from our bottom pond + Alligator Gar, Arapaima and a Wallagu. Thanks for the photos and your visits folks – it was fun having you here. 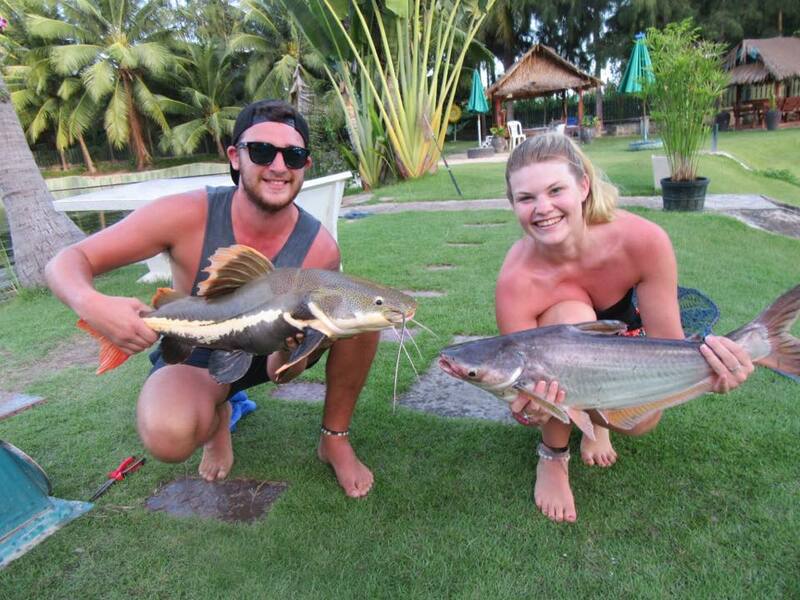 Steve Spurs Degraag and his wife Mandy are no strangers to Hua Hin Fishing Lodge, they have fished with us many times before whilst holidaying in Hua Hin. These photos are of some of their catch of 22/11/17. 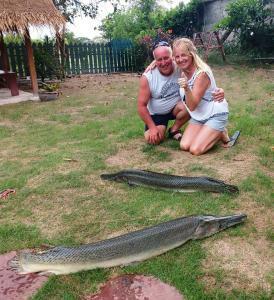 Some good Amazon Redtail for both Steve and Mandy, a Pacu and Arapaima for Steve but the catch of the day was a fine Alligator Gar – right at the end of their second day. 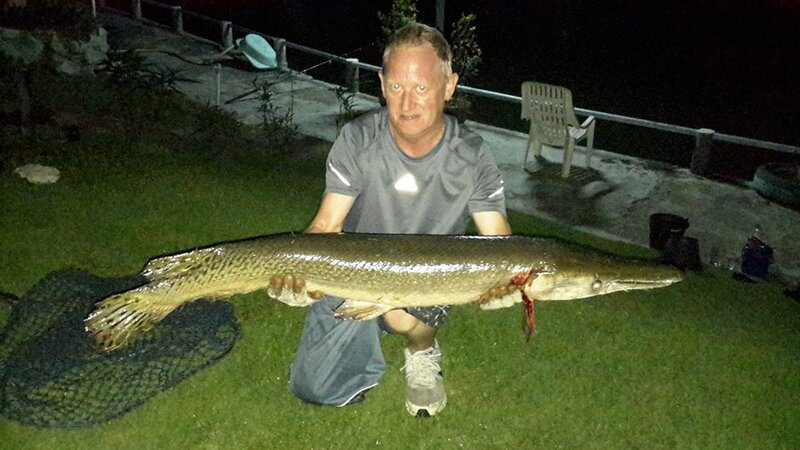 Steve has never caught a Gar before but managed this fine specimen to make up for things……………..
Terry Augustus returned to us 22/11/17 for a spot of fishing on our bottom pond. He managed to bag another of our variety of fish – this time a Wallagu. Together with an Amazon Redtail Catfish and an Arapaima, he had a good day. Well done that man. 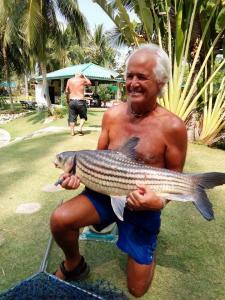 Peter Iversen is a regular customer at Hua Hin Fishing Lodge. Last Friday (17/11/17), he had a superb day catching 23 fish in total, including three species that he had never caught before. 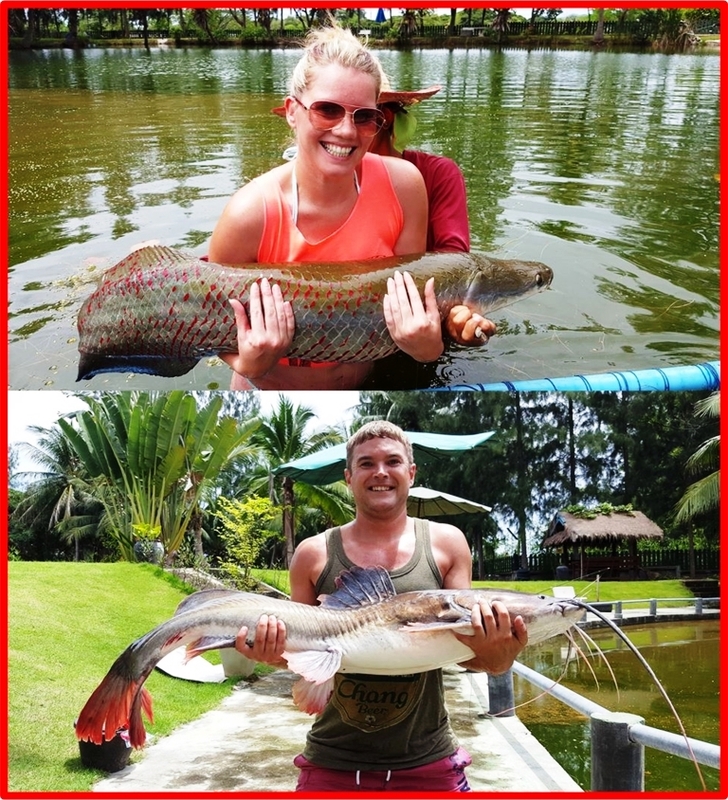 Chao Phrya Catfish, Alligator Gar (2) and an Asian Redtail Catfish were his new experiences. 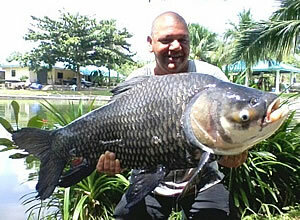 There were many other Giant Siamese Carp, Pacu and Suwai Catfish and an Arapaima. Well – variety is the spice of life – well done Peter and thanks for your continued support. 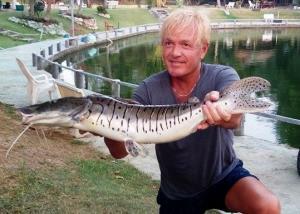 Rainer Koch has visited several times whilst holidaying in Hua Hin and is no stranger to this page. He has always had successes on both ponds and is still the only person to catch 2 Wallagu in one visit and one more on a later visit. The pictures were taken in October 2016 and September 2017. One picture is of his charming wife Renate who was normally behind the camera. The photos include plenty of Amazon Redtail Catfish, Arapaima, Alligator Gar, Asian Redtail Catfish, Clown Knifefish, Wallagu, Pacu and Giant Siamese Carp. Thank you Rainer, for sharing them with us, and thank you for your continued patronage. Hope to see you both again soon. Thanks Andy – much appreciated. 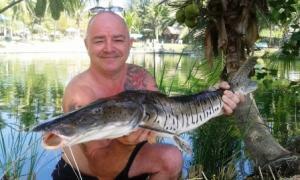 Regular customer David Rhoades joined us again, 29/08/17 and has been knobbling the Giant Mekong Catfish in our Top Pond – as above. He also managed quite a few Giant Siamese Carp in the same session. Well done again sir. (19/04/17) Kevin Young and his charming good lady have fished with us several times before. However I cannot recall ever having a couple produce a brace of Alligator Gar before. Caught at the same time and making everone totally surptised, it was a great moment to remember. Well done folks and many thanks for your return visit over the last weekend. Early this week, Jon and Collette joined us for a few hours of fishing on our bottom pond. 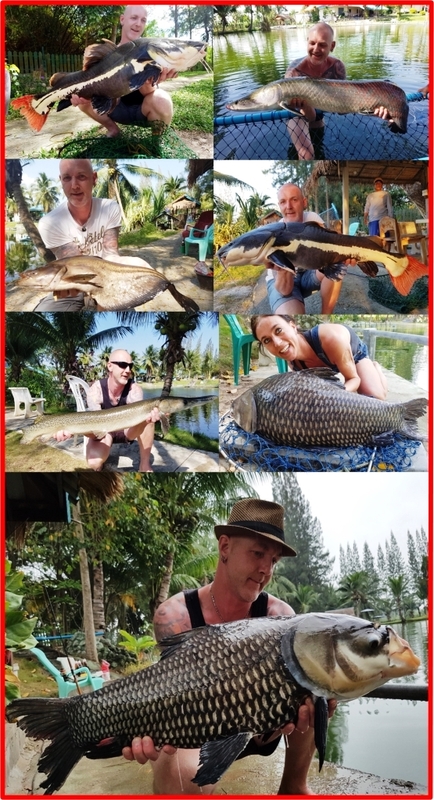 Jon was targetting Arapaima, so he was particularly miffed when only after about 90 seconds (On the first cast), Collette delivered the goods……………. 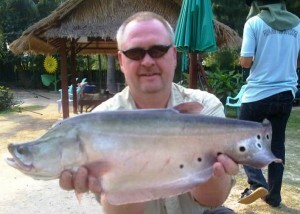 But, Jon made up for it with several other good specimens including this fine Asian Redtail Catfish. Nice having you here folks. 25/09/16 The weekend fnishes here Part 3… Yesterday (Saturday 24/09/16) was a bit of a washout, but as usual the Lodge made up for it in spades today. 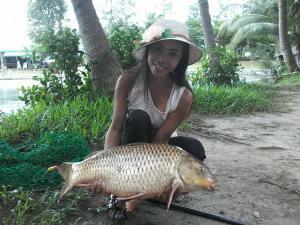 With a busy day on both ponds, there were Arapaima, Giant Siamese Carp, Krahay Thong Barb, Pacu and Suwai. There was a beautiful Asian Redtail Catfish from the bottom pond that I hope to receive a photo of very soon. 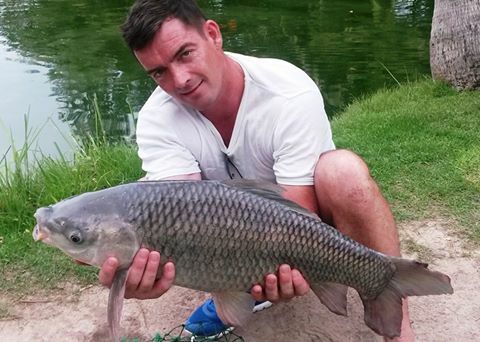 Meanwhile Nicolas was fishing the top pond and had the fish of the day – this stunning Julien;s Prize Carp. Well done Nicolas. 05/08/16 – These nice young ladies landed this brace of a Giant Siamese Carp & a Giant Mekong Catfish, with their last cast of the day, from our top pond. 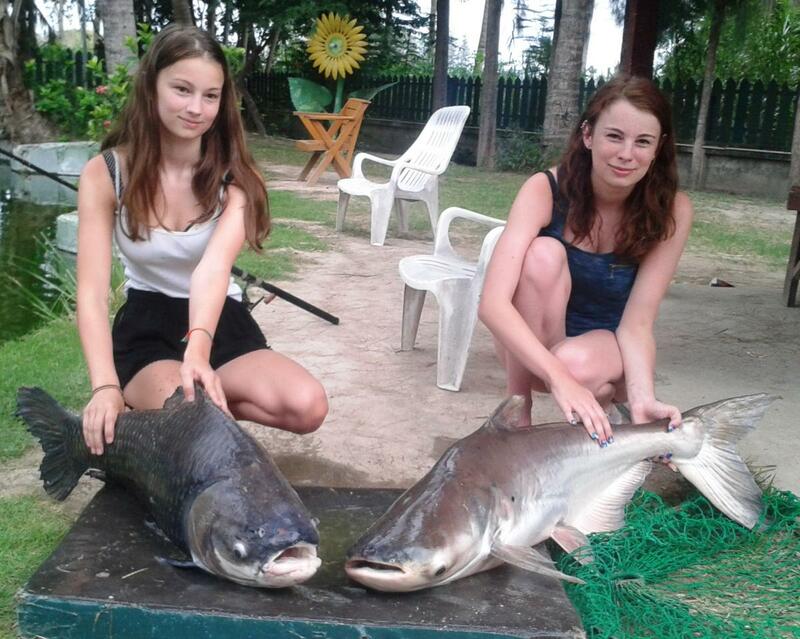 Both fish at around 18-19 Kg. Well done ladies. 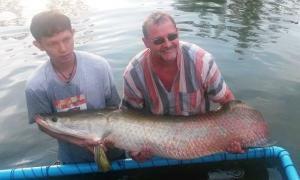 We get many many customers who wish to catch an Arapaima. But not many at 6 years of age. Well done young Franco…………. 08 July – Got this nice email this morning – Hi Terry and team, Thanks again for a fun day out on the lake! Hope my photo will make the cut for the wall. Hopefully see you all again soon. Thanks! Milli Why not? Great picture – even the Asian Redtail is smiling! It is not very often that we get Thai Ladies fishing at the Lodge. Khun Duangjai. W. and her partner joined us on Saturday and Sunday for two pleasant days of relaxing & fishing. 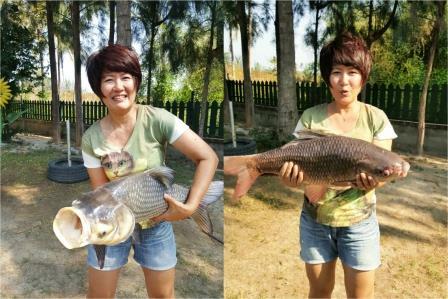 She has very kindly sent us the two photos above of a Giant Siamese Carp and a Rohu, which were just two of the many fish that they caught. As usual, it was the lady who caught more………..
Andy has been a regular returning customer who has managed to catch quite a number of our different species. This Tiger Catfish was another one yesterday (29/02/16). Well done Andy. Sam & Lauren with a simultaneous brace……. 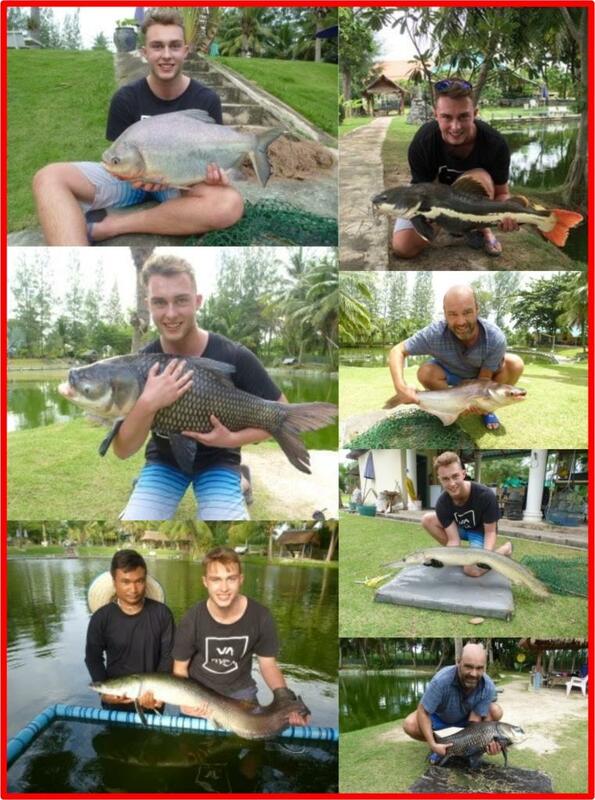 A total of at least 44 fish varieties across both ponds ranging from tiddlers up to 70 Kg. 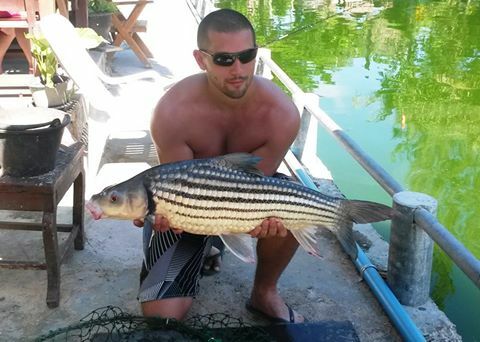 OK – our fish are NOT all monsters – however, they are big enough to test the casual angler and interesting enough for those who like something different..
Our fishing prices are STILL not monstrous either. OPEN EVERY DAY EXCEPT THURSDAYS – our normal opening hours are 09.00 to 18.30 hrs except for Christmas Day – 25 December, New Year’s Day – January 01 and Songkrhan Days – 13 & 14 April when we are closed for staff holidays. If you have G.P.S, you can find us at 12o 34′ 43.94″ N 99o 53′ 22.81″ E. Alternatively, you can get directions from our ‘Location’ map above. 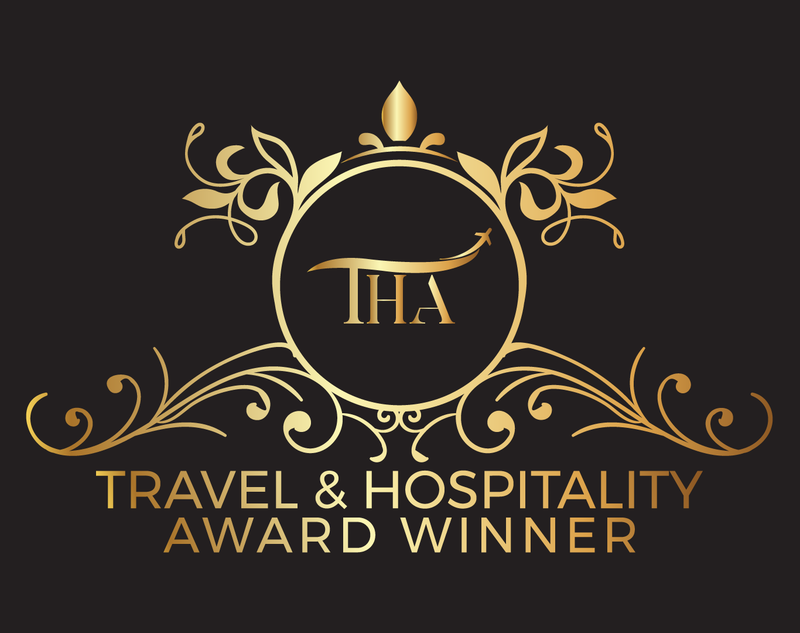 We are signposted from the Pa La U Road (We are off Highway 3218) and the main Cha Am – Hua Hin bypass Highway 37 (Also signed as AH2). You will also find us on ‘Google Maps’ and you can get directions from there. Take a look at our ‘Rooms’ – we have comfortable rooms at THB 1,500 per night, that can sleep up to three persons (more by arrangement). If you like your fishing, then you have probably seen ‘Must Fish Mondays’ ‘Fishy Sundays’, ‘Monster Fish’, ‘Fish Warrior’, ‘Hooked’, ‘River Monsters’, ‘Extreme Fishing’, ‘Catching Giants’ and other TV shows that often feature the exotic species of the Amazon and / or S.E. Asia. 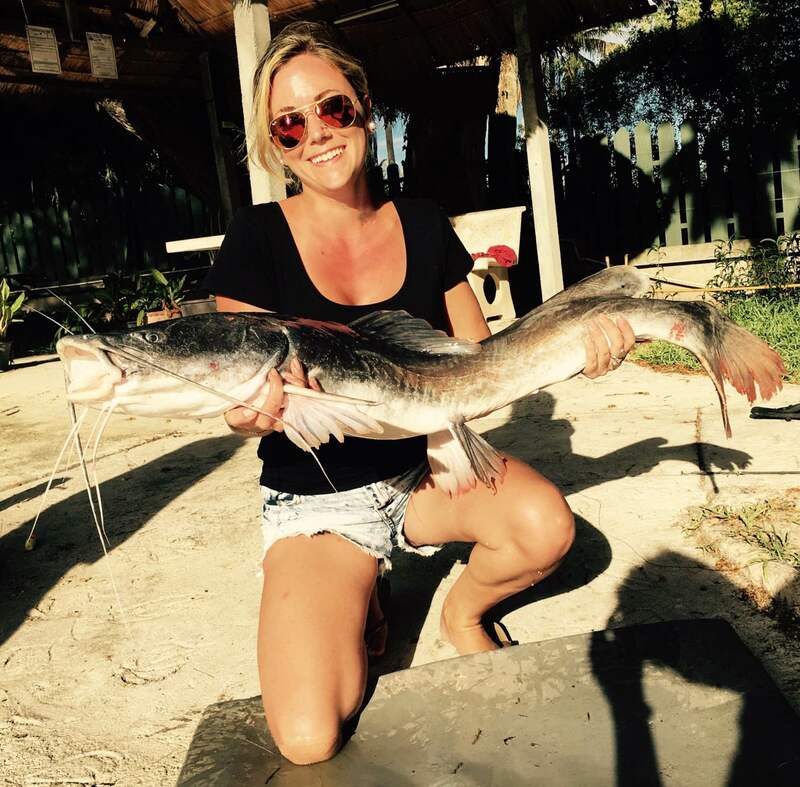 You dream of catching one of these beauties but you are on holiday with your family in Hua Hin, Thailand and just maybe, the chances of fulfilling your dreams might seem a long way off. 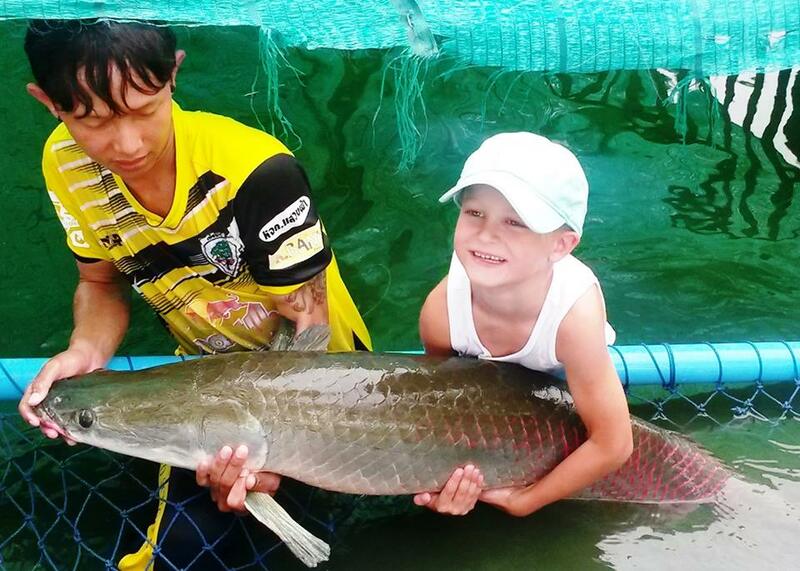 Well – it’s a lot easier than you think……………………………..
S0 – Where can you get the chance to catch Arapaima up to 176 lbs (80 Kg)? 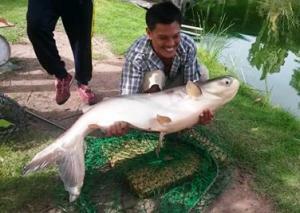 Giant Mekong Catfish up to 136 lbs (62 Kg)? 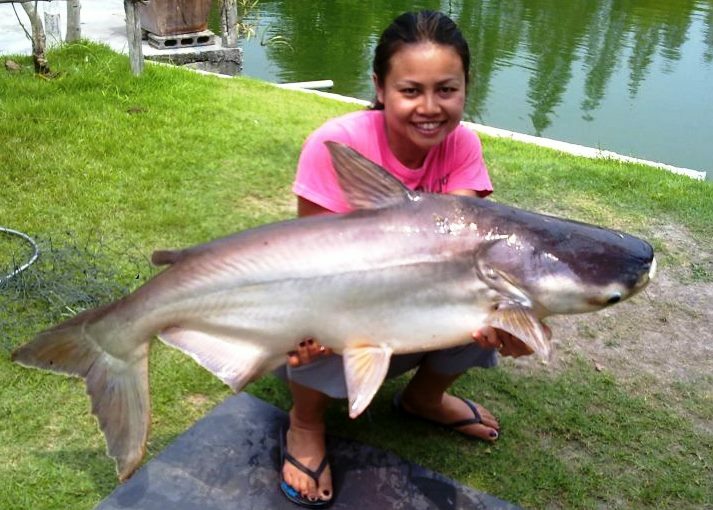 Amazon Redtail Catfish up to 73 lbs (33 Kg)? 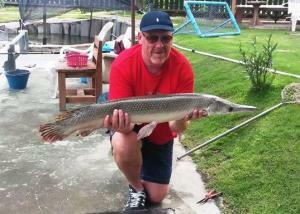 Alligator Gar up to 70 lbs (32 Kg)? Pacu up to 25 lbs (11 Kg)? or even Giant Siamese Carp up to 70 lbs (32 Kg)?, in a great setting, ONLY 10km from Hua Hin Town Centre with transport (Day package only) to & from the lodge, INCLUDING lunch (A choice of any dish from our menu and a fruit platter), with free flowing soft drinks and water, (Large bottles with Ice Bucket), tea and coffee during your visit, INCLUDING 2 (TWO) fully tackled rods and all the bait that you will need – one rod on bread, one rod on flesh bait, INCLUDING assistance of a baitman / gillie / guide, for just THB 4,300 / adult – THB 1,900 / child under 12 and THB 600 / accompanying non-fishing guest……. AT HUA HIN FISHING LODGE THAT’S WHERE! TAKE A LOOK AT OUR VIDEO GALLERY. The link is at the top of this page. If YOU have a video taken recently at the Lodge and it’s uploaded on ‘YouTube’ – let us know and we can showcase it here on this site. 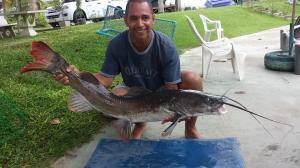 **WHAT IS CATCH & RELEASE FISHING? Catch and release fishing is a practice within recreational fishing, intended as a technique of conservation. 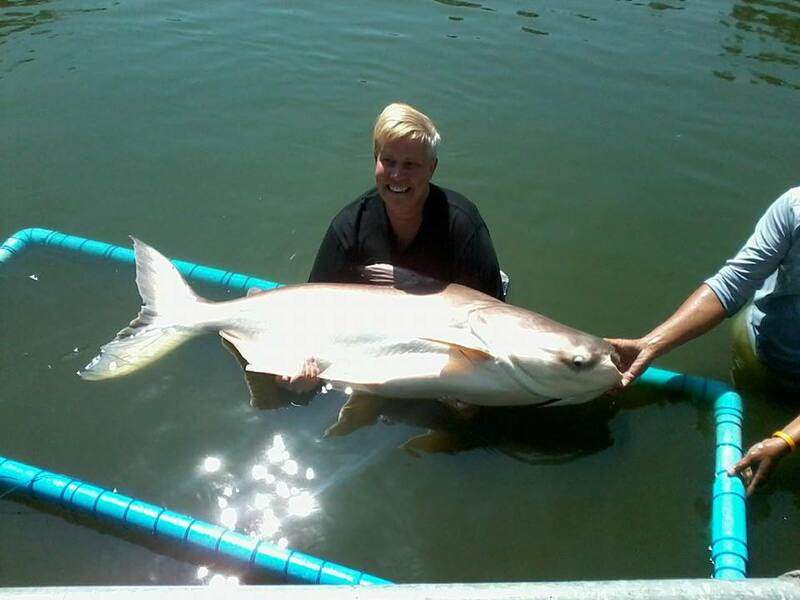 After capture, the fish are unhooked and returned to the water before experiencing serious exhaustion or injury. Using barbless hooks, it is often possible to release the fish without removing it from the water (a slack line is frequently sufficient). 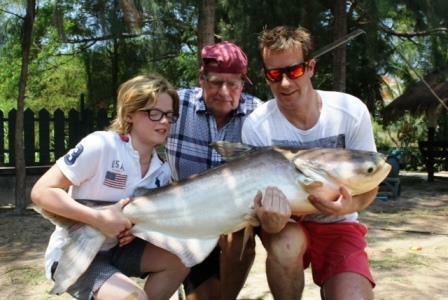 Recreational Fishing (Catch & release) is one of the most popular pastimes in the World. More than 100 million Americans & Europeans regularly go fishing. Fisheries are responsible for maintaining healthy and productive fish populations. What is good fishing to one person, may not be good fishing to another. Some anglers don’t care what they catch as long as they catch something. Other anglers are only interested in certain species of fish. Some want to catch lots of fish while others want big fish. Still others don’t care if they catch anything as long as they get to relax in the beautiful outdoors. 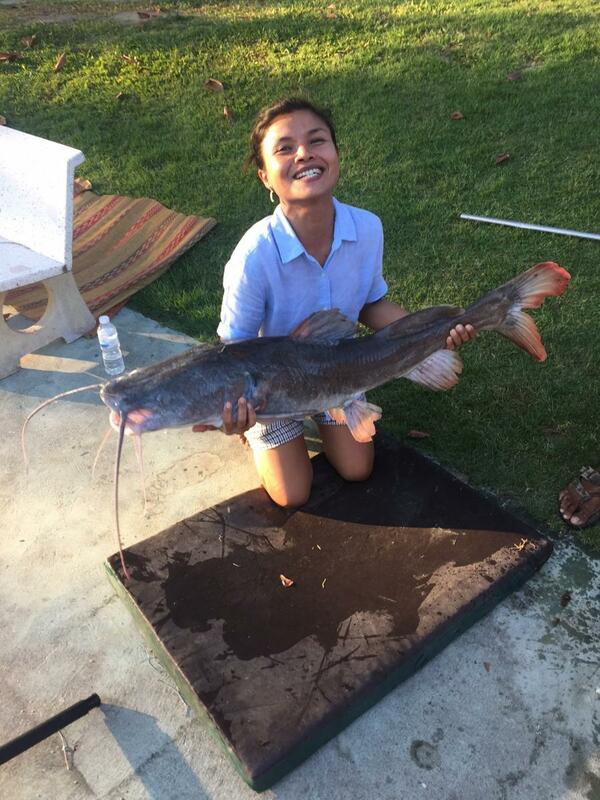 At Hua Hin Fishing Lodge we try and accommodate all of these needs. Hua Hin Fishing Lodge proudly holds at least 7 (Seven) species of fish that are currently listed on the ‘Endangered’ or Critically Endangered’ species list of WWF. So – before you decide on a freshwater fishing experience in Hua Hin ………..